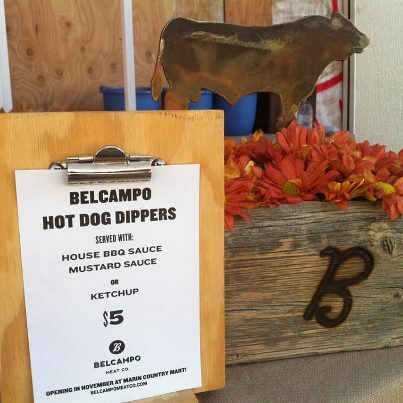 Belcampo Meat made an appearance at Marin Country Mart‘s Autumn fest last weekend, offering delicious looking hot dog dippers with homemade BBQ sauce. There were also demonstrations in how to breakdown a chicken into 8 pieces, butterfly a chicken, and truss a bird, just in time for those all important holiday dinners. Belcampo will be opening a butcher shop at Marin Country Mart in November, designed by BCV Architects. It will be a perfect complement to the other artisanal food purveyors found there, in addition to the weekly farmer’s market held there every Saturday. The above photo was found on their Facebook page, a great source for frequent Belcampo updates, check it out here!